I have the Duca is the t7 any different. I have the Duca abd she is fun. I get random Toro hit. The speed is great but you turn and speed drops fast. Is the new t7 any different. Its got 2 extra guns but not sure if thats enough for 30ish dollars. It's stealthier with CE, camo and can get closer to caps to help DD's. Here come the Abruzzi is crap comments as an fyi, lol. I worry about the CIT hits. Reading LWM's review, it seems like the ship can get deleted rather fast, and since it is a cruiser, it can become a high priority target for BBs all of a sudden. I just might wait until Santa crates come around and see if I get one, or if it goes into the tech tree, I might waste some of my doubloons on it. Abruzzi is not as bad as the reviews have stated IMO. I like it better than d'Aosta. And OP - both ships are "Duca" so you need to say d'Aosta or Abruzzi when speaking of them for clarity. It plays just like the Duca but with heals. Makes it quite fun. I do wish the guns packed just a little more punch. IF/HE is a must. Is it really 66% more fun, because it costs 66% more. If you like dAosta, Abruzzi is much better. Abruzzi can do everything dAosta can, but in a better way. Abruzzi is better but its only middling good. The Duca is overtiered and should be a T5. WG hasn't gotten around to admitting its error, it's not very good at admitting errors. I think many of us Duca owners would be happy to accept downtiering w/o compensation, so we could at least play the ship. Are you listening WG? Send around a survey to find out what Duca owners think -- you know who owns one. ... except deal damage with her AP shells, survive battleship return fire, and turn. Like any other T7 cruiser, or like most cruisers in the game. All cruisers in the game are fragile and easy to citadel. In that regard, Abruzzi has better chance to survive than most cruisers due to the combination of good speed, agility, great concealment and a heal. True, Abruzzi Ap is disappointing. survive battleship return fire, and turn. Sliglhly less agile than dAosta, but still good mobility to dodge incoming shells. But with better concealmet and a heal. I am enjoying both ducas and survive 50% of my games. Random battles that is. The only downside to them is that takes some effort and skill to go over 40k damage. She deals dmg just fine with AP as top tier; am guessing your just generalizing here. As for higher tiers, cannot say(been lucky with MM). BB return fire is a problem, but hardly different than any other light cruiser. She turns pretty well, hardly a problem there. The comparison was with Duca d'Aosta which was said to be better. 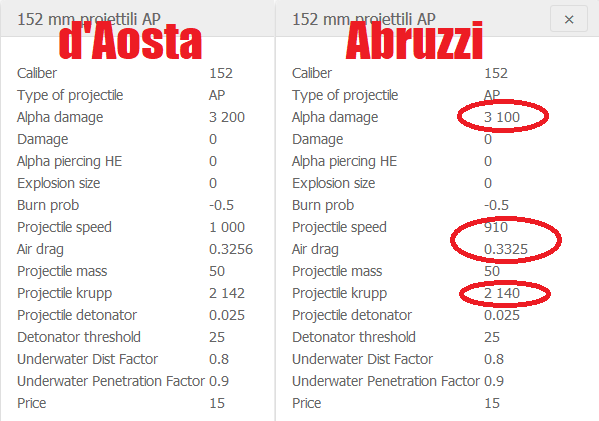 Abruzzi's AP shells are worse. They do less damage, have worse muzzle velocity and shell drag coefficients and (nitpickingly) marginally less Krupp for some reason. In practice, this works out to 10% less penetration at any range. This is bad news given the anemic performance of her HE shells and her fire chance. This is bad news given the anemic performance of her HE shells and her fire chance. I can't help but think improving the fire chance on both of these ships would make them more competitive. Hypothetically, would a buff of this nature not be fairly simple to implement without upsetting the balance of other ships in their respective tiers? I personally liked the suggestion of the Regia Marina having 1/4 shell diameter penetration on their HE shells like German cruisers. There's historical precedence for it too and this would artificially increase their fire setting chance (they would no longer have to take IFHE). that how I look at money. T7 was worth the money. The new bundles are crazy. There adding money and that makes it to much. After all I am buying a prem to get ride of money problems. Aousta is a better ship than Abruzzi, end of discussion. Both ships are weak for their tier, but the Aousta plays very will with a skillful player while the Abruzzi will let that player down. If both ships were at the same tier and costed the same amount of money the Aousta would still be better. In my humble opinion LittleWhiteMouse was too lenient on the Abruzzi. Repair party is not an asset to the Abruzzi. It is a poor attempt at mitigation and will also force you to burn 3 captain points on super intendent. In fact all your captain skills will be spent trying to fix this stupid ship rather than building her to your play style. Wargaming should be ashamed of pushing out this garbage. No amount of captain skills or upgrades will fix this floating turd. She will always have to go into a fight she can't survive to spew her near useless shells and dirpedoes. The best way to use the Abruzzi to improve your game play is to play against her. Get the Scharnhorst, a real tier 7 premium ship. The Aousta is a good ship. All of her shells and torps are garbage but the ship itself is amazing. The Abruzzi is a piece of crap. All of her shells and torps are garbage and the ship itself is garbage. There are a LOT of good tier 7 premium ships in this game. The question is do you personally think Abruzzi is good enough AND different enough from all these ships to warrant spending money on and playing it in place of all these other good premiums. My answer is - hell no. Why would I waste money (and valuable time) on it when I have better ships like Nelson, Hood, Belfast, Blysk, Leningrad, Atlanta, Indie and etc to play instead. Your opinion can be different. Blys, Leningrad and Nelson are great ships, but none is a cruiser. Belfast is OP and its not availeble anymore. Hood, Atlanta and Indy are meh ships, not any different from Abruzzi. Abruzzi is on same level as other T7 premium cruisers. Also i prefer 380mm gun ships in t7-t8 over 400mm+ ships now that leaves me with roma gascogne richelieu ships in with i excel but everyone else hates. Abruzzi is on same level as other T7 premium cruisers. This is nonsense from a romance perspective and not an objective one. Abruzzi is not on the same level with other T7 cruisers by any realistic perspective. You just say that because you want to fancy the ship.